Reading and share top 18 famous quotes and sayings about Book Thief by famous authors and people. Browse top 18 famous quotes and sayings about Book Thief by most favorite authors. 1. "Yes, often, I am reminded of her, and in one of my vast array of pockets, I have kept her story to retell. It is one of the small legion I carry, each one extraordinary in its own right. Each one an attempt- an immense leap of an attempt- to prove to me that you, and your human existence, are worth it. Here it is. One of a handful. The Book Thief.If you feel like it, come with me. I will tell you a story.I'll show you something." 2. "I saw the book thief three times." 3. "He was the crazy one who had painted himself black and defeated the world.She was the book thief without the words.Trust me, though, the words were on their way, and when they arrived, Liesel would hold them in her hands like the clouds, and she would wring them out like rain." 4. "The book thief has struck for the first time – the beginning of an illustrious career." 5. "When I found it amongst the book thief's words, I realised that we passed each other once in a while during that period, though neither of us scheduled a meeting. Personally, I had a lot of work to do. As for Hans, I think he was doing his best to avoid me." 6. "On many accounts, taking a boy like Rudy was a robbery - so much life, so much to live for - yet somehow, I'm certain he would have loved to see the frightening rubble and swelling of the sky on the night he passed away. He'd have cried and turned and smiled if only he could have seen the book thief on her hands and knees, next to his decimated body. He'd have been glad to witness her kissing his dusty, bomb-hit lips.Yes, I know it.In the darkness of my dark-beating heart, I know. He'd have loved it, all right.You see?Even death as a heart." 7. 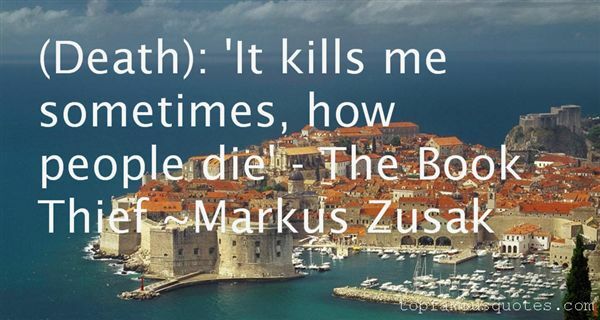 "(Death): 'It kills me sometimes, how people die' - The Book Thief"
8. "She slid a book from the shelf and sat with it on the floor.She tore a page from the book and ripped it in half. Then a chapter.Soon, there was nothing but scraps of words lttered between her legs and all around her. The words. Why did they have to exist? Without them, there wouldn't be ant of this.What good were the words?The book thief stood and waled carefully to the library door." 9. "Steadily, the room shrank, till the book thief could touch the shelves within a few small steps. She ran the back of her hand along the first shelf, listening to the shuffle of her fingernails gliding across the spinal cord of each book. It sounded like an instrument, or the notes of running feet. She used both hands. She raced them. One shelf against the other. And she laughed. Her voice was sprawled out, high in her throat, and when she eventually stopped and stood in the middle of the room, she spent many minutes looking from the shelves to her fingers and back again. How many books had she touched? How many had she felt? She walked over and did it again, this time much slower, with her hand facing forward, allowing the dough of her palm to feel the small hurdle of each book. It felt like magic, like beauty, as bright lines of light shone down from a chandelier. Several times, she almost pulled a title from its place but didn't dare disturb them. They were too perfect." 10. "Once in while a man or a woman--no, they were not men and women; they were Jews--would find Liesel's face among the crowd. They would meet her with their defeat, and the book thief could do nothing but watch them back in a long, incurable moment before they were gone again. She could only hope they could read the depth of sorrow in her face, to recognize that it was true, and not fleeting.She understood she was utterly worthless to these people. They could not be saved.Then, one human. Hans Hubermann." 11. "A statue of the book thief stood in the courtyard... it's very rare, don't you think, for a statue to appear before it's subject has become famous?" 12. "For at least twenty minutes she handed out the story. The youngest kids were soothed by her voice, and everyone else saw visions of the whistler running from the scene. Liesel did not. The book thief saw only the mechanics of the words--their bodies stranded on the paper, beaten down for her to walk on. Somewhere, too, in the gaps between a period and the next capital letter, there was also Max. She remembered reading to him when he was sick. It he in the basement? she wondered. Or is he stealing a glimpse of the sky again?" 13. "He lay with yellow hair and closed eyes, and the book thief ran toward him and fell down. She dropped the black book. "Rudy," she sobbed, "wake up...." She grabbed him by his shirt and gave him just the slightest disbelieving shake. "Wake up, Rudy," and now, as the sky went on heating and showering ash, Liesel was holding Rudy Steiner's shirt by the front. "Rudy, please." THe tears grappled with her face. 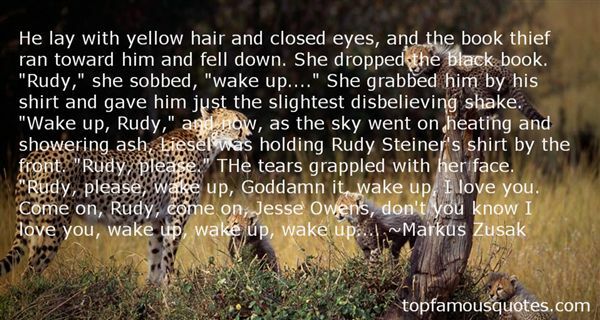 "Rudy, please, wake up, Goddamn it, wake up, I love you. Come on, Rudy, come on, Jesse Owens, don't you know I love you, wake up, wake up, wake up...."
14. "And I can promise you something, because it was a thing I saw many years later - a vision in the book thief herself - that as she knelt next to Hans Hubermann, she watched him stand and play the accordion. He stood and strapped it on in the alps of broken houses and played the accordion with kindness silver eyes and even a cigarette slouched on his lips. The bellows breathed and the tall man played for Liesel Meminger one last time as the sky was slowly taken away from her." 15. "Summer came.For the book thief, everything was going nicely.For me, the sky was the color of Jews.When their bodies had finished scouring for gaps in the door, their souls rose up. When their fingernails had scratched at the wood and in some cases were nailed into it by the sheer force of desperation, their spirits came toward me, into my arms, and we climbed out of those shower facilities, onto the roof and up, into eternity's certain breadth. They just kept feeding me. Minute after minute. Shower after shower." 16. "Rudy Steiner was scared of the book thief's kiss. He must have longed for it so much. He must have loved her so incredibly hard. So hard that he would never ask for her lips again and would go to his grave without them." 17. 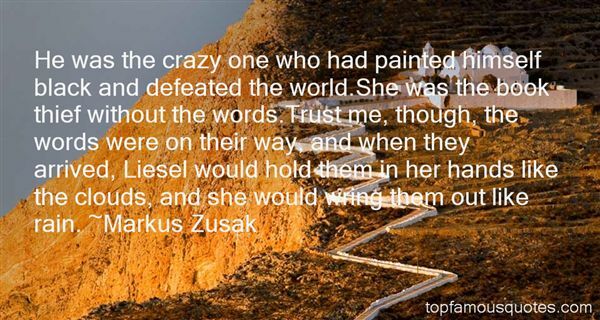 "She was holding desperately on to the words who had saved her life." The Book Thief"
18. "Out of the closets and into the museums, libraries, architectural monuments, concert halls, bookstores, recording studios and film studios of the world. Everything belongs to the inspired and dedicated thief…. Words, colors, light, sounds, stone, wood, bronze belong to the living artist. They belong to anyone who can use them. Loot the Louvre! A bas l'originalité, the sterile and assertive ego that imprisons us as it creates. Vive le vol-pure, shameless, total. We are not responsible. Steal anything in sight." Dean flashed me a smile that promised rule-breaking and breathlessness."